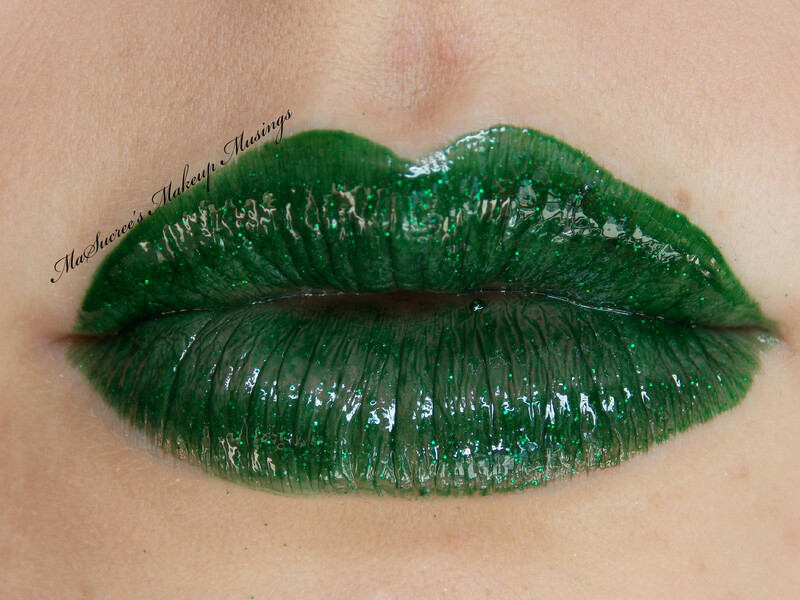 Today’s post is all about green lipstick. 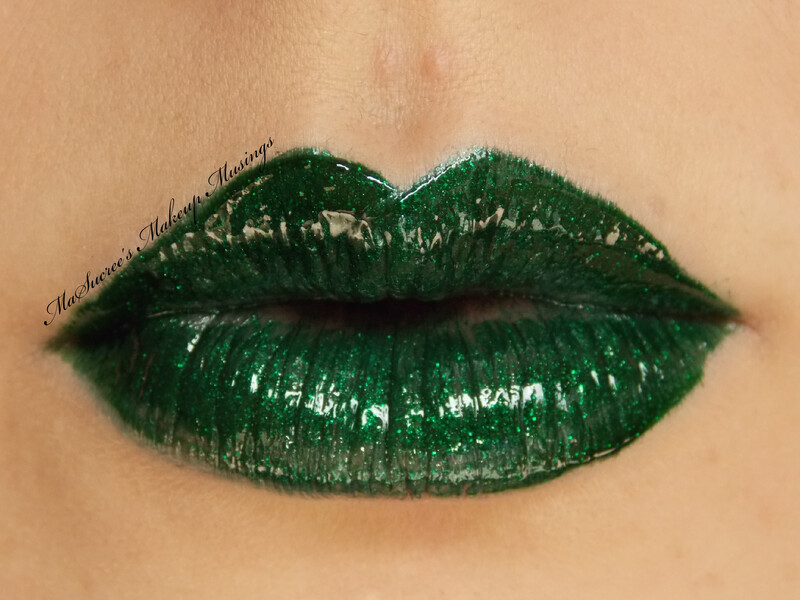 Green is my favourite colour and ever since I found out that Lime Crime had a green lipstick called Serpentina I have been itching to get it. The thing with Serpentina is that it is usually in stock no where! Like no where at all! I may have sobbed a little bit. However I found out that for Halloween last year that they were releasing it again. One of my bestest friends brought it for me for Christmas, she knows me so well :3 I have worn it quite a few times to work and each time I get a heap of questions. So take a look at both of these pretties and don’t be afraid of how very green they are. The Lime Crime packaging is just uber cute, I still keep all my Lime Crime lippies in the boxes they came, because they are just as cute. Above is Hollyglam. You can see that it has not got the most amazing coverage. The only problem I have with the packaging is the brush that comes with it, it is tiny and not very good at drawing lines. If you look a little closely you will also see a little splatter below my lower lip where the brush flicked out some of the gloss. I found with the glosses that they migrated very quickly, they are hard to keep in place and at lunch I have to completely take it off and reapply or else it bleed horribly and I looked infected. As much as I get frustrated by the application and wear time on this gloss, I still really enjoy wearing it and I am glad I brought it. Above is Serpentina. You can see that it is quite a dark lipstick and not nearly as shiny as the gloss (well naturally), its almost frosty/metallic. I found this one a lot easier to layer compared to the gloss, through the day as I topped it up it just got more and more opaque. It did bleed, but not as much as the gloss and with a good lipstick sealer it stopped happening. 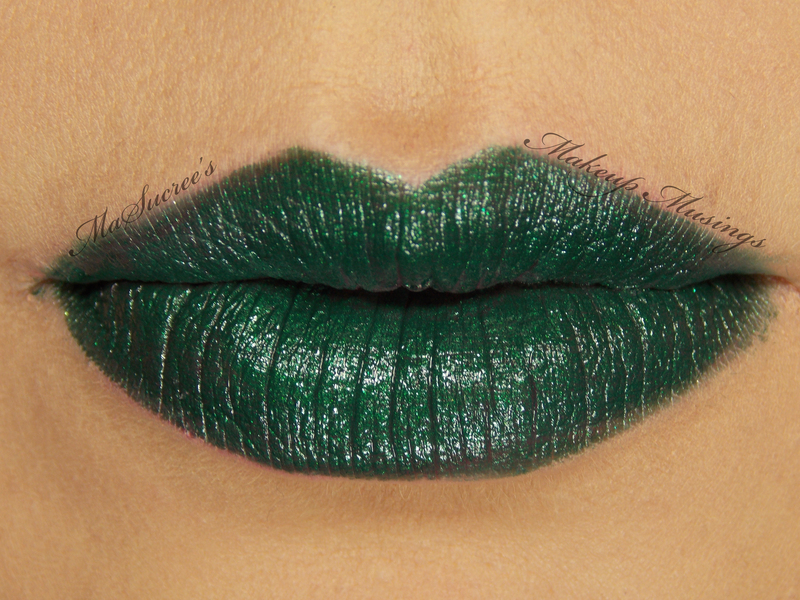 Serpentina wins for me because I think the shade of green suits me better and it just wears a lot easier. Even though it is a pain to photograph -_- So have another photo just to make sure you see how awesome it is. 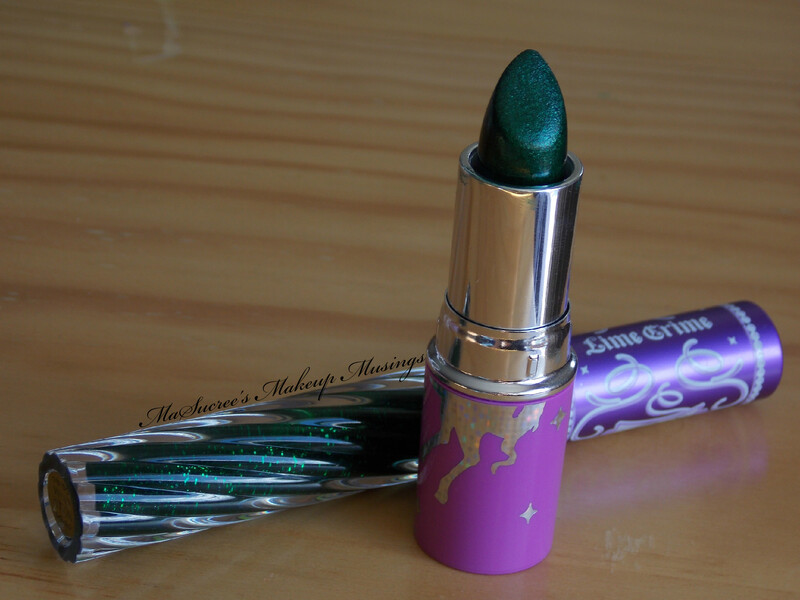 Something I was shown when I popped into a local store that stocks Lime Crime was putting Hollyglam over Serpentina. It is amazing. Just to make sure you see how truly magnificent it is have another photo. 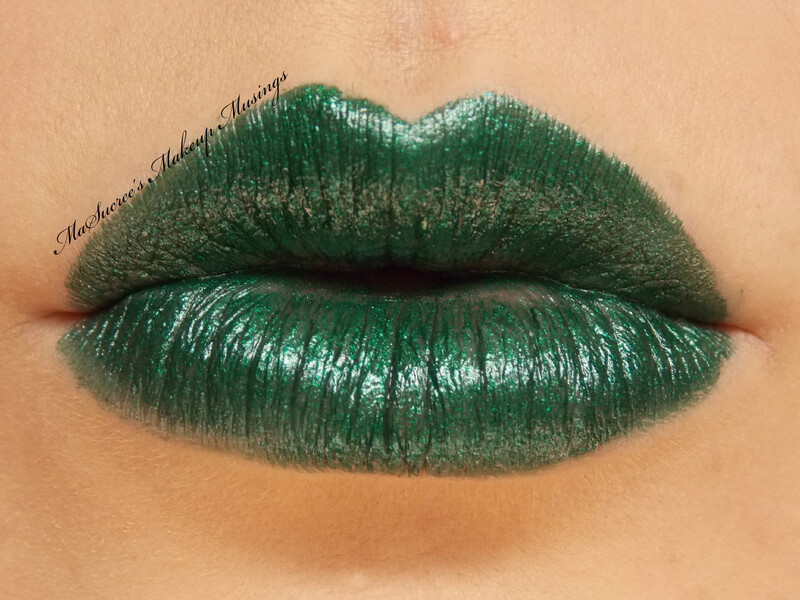 I would not say that the Lime Crime glosses are the most amazing quality glosses, but I think that the lipsticks are pretty good. 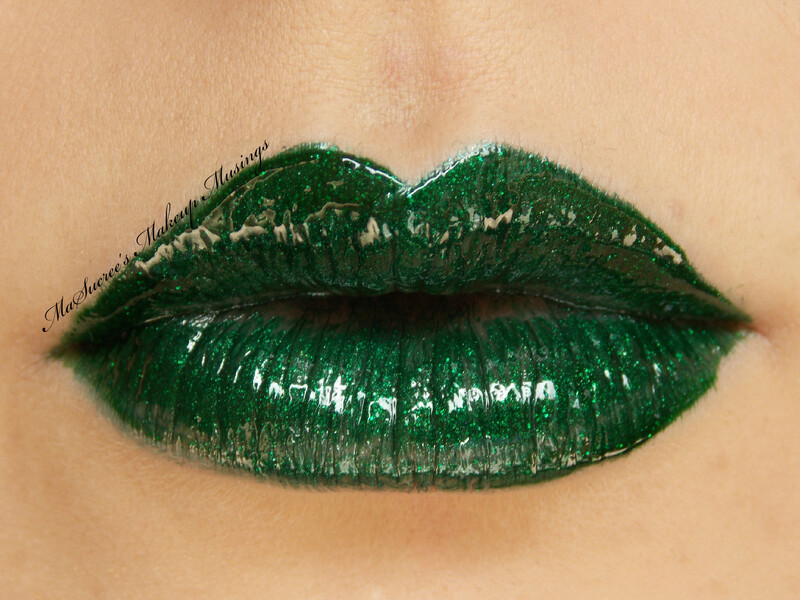 I would even say because Serpentina is the newest one I have that they have improved their quality recently too. Bleeding does not bother me at all, even some of my MAC lippies bleed a little, that’s why I have a clear lip liner and lipstick sealer. I will try and remember to share my lipstick sealer with you as well. For me I enjoy these lipsticks more for their amazing colour. 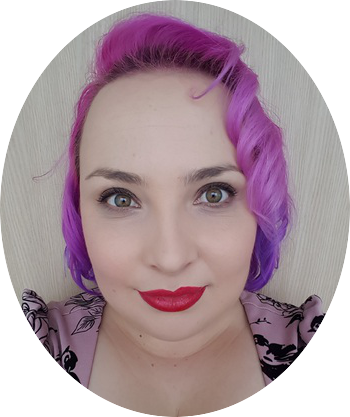 *happy sigh* It is crazy how long it took me to try bright pink lipstick and now here I am running about with dark green lipstick on. Every person who has said something to me about has had something positive to say. I am very lucky that my work is not bothered by what colour lipstick I wear and even have their favourites of the not so usual colours I have. 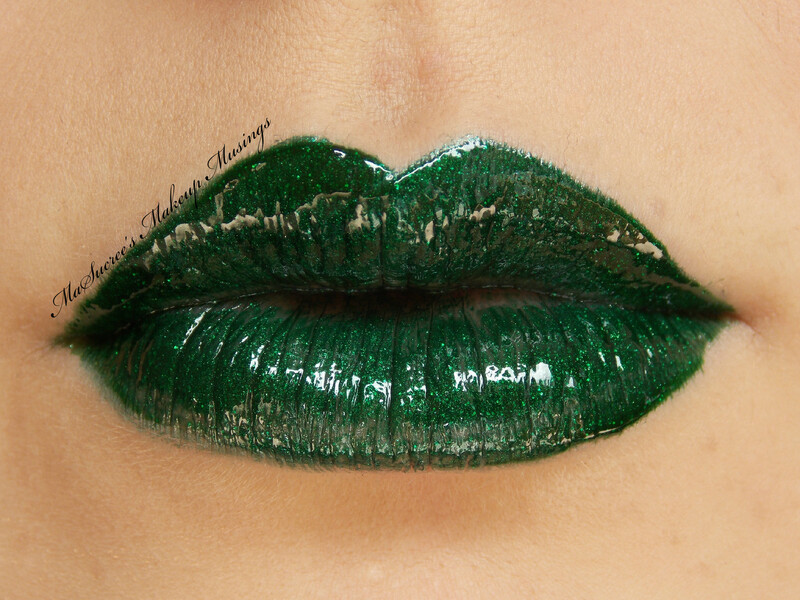 My next lipstick must have is Blow from Melt Cosmetics and maybe even DGAF. Do you have any not so usual coloured lipsticks? I’m planning on buying a couple colored lipsticks this week. Green and light blue probably.